The Women’s Madison of Lydia Gurley and Lydia Boylan have finished 8th at the European Championships in Glasgow today. The 120 lap race was fast paced from the start, with no teams gaining a lap throughout the 30km. Gold went to Denmark, silver to Russia and bronze to Netherlands. An attack with 25 laps to go saw the Irish women look for a lap, but with the points tight at the top, they were not given the opportunity – they held on for second in the sprint, and the much needed 3 points to put them into 8th place. Last year at this event Gurley and Boylan won a silver medal; with the Madison now on the Olympic Programme, the standard of racing in this event increases each year. At the World Cups the distance for the Women’s Madison is 80 laps, significantly shorter than today’s 120 lap race. 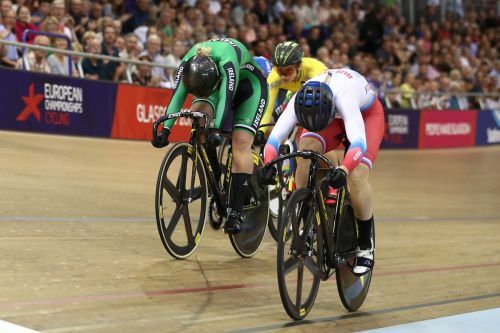 Earlier this morning an incredible ride from Robyn Stewart in the Women’s Keirin saw her just miss out on the one place on offer to the semi finals in her repechage at the European Championships in Glasgow today. The Belfast woman was fourth in her heat earlier today. With the first two automatically progressing to the semi-finals Stewart had to race again in the repechages. The winner would progress to the second round. Stewart raced a tactically smart race making her move with one lap to go, passing the Lithuanian and Italian riders. In the home straight Stewart pushed again moving around double European Champion Daria Shmeleva of Russia. On the line she had to settle for second in what was a phenomenal race for the relative newcomer to cycling. Speaking after the race Stewart said – “I’m still buzzing – it was exciting for me. I tried to be patient and tried to look for gaps and come underneath, and do the opposite to what I did in the first round. In the first round I just went full gas. It was really close there in the end – and I feel positive. “Daria, the girl that won, she’s the current sprint and 500m European Champion, so not too bad that I didn’t quite get around her. Marc Potts has finished 11th in the Men’s Elimination Race at the European Championships in Glasgow today. Potts was looking strong for the first half of the race moving easily through the groups. When the bunch lined out he found himself towards the back and at a disadvantage in the tactical race where the last rider over the line on every second lap is knocked out. “It felt like at the start of the race I was doing the right things and making the right moves and I was reading it quite well, and not really using any legs. About five laps before I went out there I made the mistake of not coming over the top trying to be more savvy, and thinking I was saving a bit more energy. Potts is targeting the Omnium for the Tokyo Olympics and has been riding strongly in this event throughout the summer. However, due to the earlier date of these Championships, English was the only Irish rider who could compete in the Omnium in Glasgow in a bid to qualify points for the World Cup season which kicks off in October. 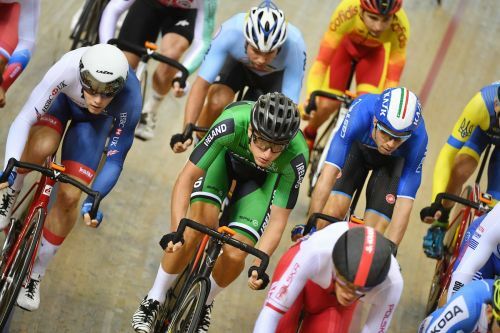 Today was the final day of track cycling, attention now moves to the mountain bike race – with Gareth McKee representing Ireland this afternoon. History is made this week when Glasgow and Berlin host the inaugural European Championships, an exciting multi-sport event bringing together some of the continent’s leading sports, including the existing UEC cycling championships. Lydia Boylan has finished 5th in the Women’s Omnium at the European Championships in Glasgow today. Strong performances in both the Tempo Race and the final Points Race contributed to her high overall placing in this Olympic event in a highly competitive field. The Omnium is a four-race event with the winner being the rider who accumulates the highest number of points across four bunch races. Boylan scored highly in both the Tempo Race, where she finished second and the Points Race where she was sixth, resulting in a fifth place in the event which was won by World Champion Kirsten Wild (NED). Katie Archibald (GBR) won silver and Letizia Paternoster (ITA) won bronze. 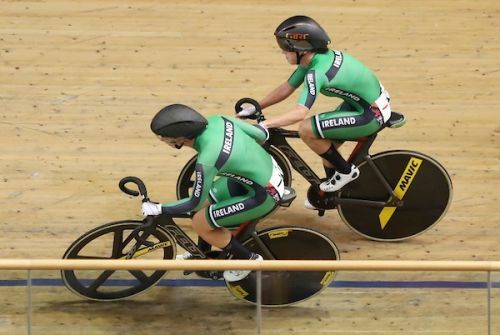 Tomorrow is the final day of track cycling, with Boylan and Gurley competing in the Madison – an event that has been added to the Olympic Programme for Tokyo. Robyn Stewart will also be in action, competing in the Keirin, and Marc Potts will compete in the Elimination Race. Away from the track Gareth McKee will be competing in the Mountain Bike racing. The Men’s Madison of Felix English and Mark Downey have finished 11th in the European Championships in Glasgow. This is the first event in the Olympic qualification process, and was won by a dominant Belgium pairing. World Champions Germany won silver and Great Britain moved in to the bronze medal position with the final sprint. 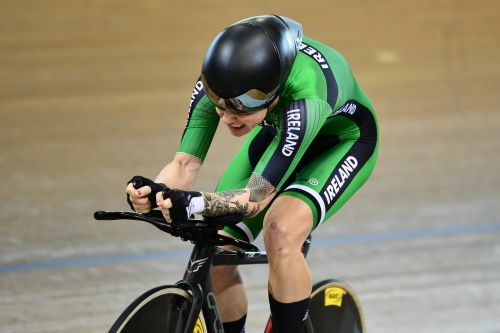 Earlier this morning Orla Walsh finished 15th in the 500m Time Trial with a personal best time of 36.478, which was just outside the Irish national record of 36.290 set by Robyn Stewart. At the halfway mark in the Women’s Omnium Lydia Boylan is lying in fifth place, after finishing 2nd in the Tempo Race and 9th in the Scratch Race – the overall winner after four events will be the person with the most points. Competition continues this evening. Speaking after the Madison Final Felix English was disappointed with their result, but drew positives from the race – “It’s disappointing, we had a really tough morning with the qualification, we had to go a lot harder than we thought we would. But I thought that if I rode a controlled race this afternoon that it would have been okay. “The things that we have improved on tactically have now shown up our other flaws. Like we are able to follow on the right laps and schedule in for the right time for the sprints which we could never do before. But now that we are on those laps, we are going too hard in the sprint and from too far back so positioning in the bunch is now our main focus. Lydia Boylan finished the second event in the Omnium – the Tempo Race in second place, attacking with ten laps to go. The Tempo Race is a fast-paced event with points awarded for the first over the line on each lap, which meant the Dublin rider picked up ten vital points to place her second. Pleased with her Tempo Boylan said “I can’t really match the other girls for brute power – but that’s what’s cool about the omnium, there are a lot of different tactics you can roll. I love the Tempo because it is just so hard and fast all the time, and it’s literally who has the best legs at the end, the one who is willing to put it on the line. In the Omnium the overall winner is the highest placed rider at the end of four events, with points being awarded for the finish position in each event. Earlier this morning she finished 9th in the Scratch Race. Boylan competes in the Elimination Race and the Points Race later on this evening. Also in action was Orla Walsh, competing in the 500m TT, achieving a PB in this event. The Time Trial is often described as one of the toughest events on the programme – “it’s just pedal until you’re blacking out! That’s how it feels – just keep going until the line. Walsh is relatively new to cycling and is a member of the Talent ID squad, “I only joined a cycling club in 2016, and last year as part of the talent transfer programme I was selected to train with the girls over in Majorca so we have been doing that for the past year. This is our second competition ever, so this is all brand new, and we are getting to know it and learn how to race. Later this evening Boylan competes in the Elimination Race at 19.01 and the Points Race at 20.06. 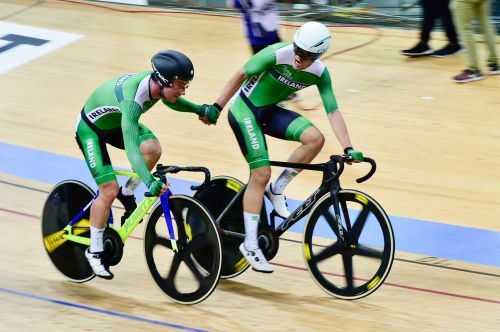 The Men’s Madison of Felix English and Mark Downey are through to the Madison Final at 14.41 today having qualified second out of their heat at the European Championships in Glasgow today. The Irish duo were competing in the first heat of the day with seven teams out of nine progressing to the next round. English felt the early effort in the closing 30 laps, and Ireland briefly lost touch with the lead bunch – “I went off a bit too hard in the first 60 laps – we went for every sprint and I wasn’t really saving anything – I was just going full gas. But Mark got us back on again, which we needed – if we didn’t get back on there we weren’t going to qualify. Next on the track is Lydia Boylan kicking off her European Championship campaign with the Women’s Omnium. 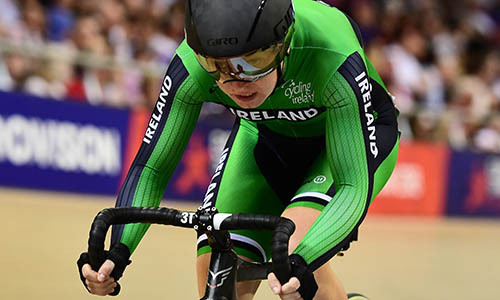 Orla Walsh will also be competing in the Women’s 500TT.